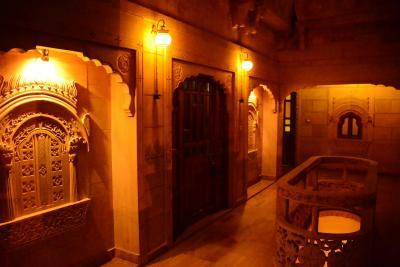 Lock in a great price for Hotel Pleasant Haveli - Only Adults – rated 9.3 by recent guests! Beautiful hotel inside and out. It's on a quiet and charming local street. We stayed 2 nights. Because it was booked up, and we booked before and after a night on a camel safari (offered through the hotel, also great) we had two different rooms. The suite is just a little bigger than the standard room, they were equally nice otherwise. I actually liked the street view from the standard room better. The upstairs restaurant was slow but good. Order the Rajasthani thali! The location was great, an interesting ten minute stroll to the fort. Everything about the hotel itself was excellent from tastefully decorated rooms, modern bathrooms, comfortable beds, helpful staff who gave us late checkouts twice (we did two nights but with a desert overnight in between also organised by the hotel, a fantastic experience.) Best of all was Krishna who could not have been more helpful. He organised train tickets before we even got there after we received notification that our flight out of Jaisalmer was cancelled, as well as two car transfers to and from Jodhpur (the train from Jaisalmer was fully booked so took train from Jodhpur). We were there for Holi, such fun! I can not recommend this hotel and it’s sta more highly. We loved everything about this elegant boutique hotel. The rooms were stunning, the hot water plentiful, and the hospitality worthy of a five star hotel anywhere in the world. There is also a great same day laundry next door (Bobby’s) and an excellent textile shop on the ground floor. Service was provided with a pleasant attitude and an aim to please! Everyone was super nice. I especially liked the textile gallery in the lower level, and make a big thank you to Bhawani for sharing his beautiful collection! Location was great. The staff was fantastic. The food was good. We loved the quiet neighborhood and rooftop lounging areas. We also greatly enjoyed the safari trip. We chose to do the half-day trip with dinner and returned that evening after watching the stars. Our guides were lovely and the food was great. Very pleasant mid size hotel located in a quieter part of town, but a short walk from most of the things you may want to see. Very helpful staff is able to arrange whatever you may want to see in the broader area without pressuring you for other options you may not be interested in, particularly camel “safaris”. The rooftop restaurant well serves the need for mid-day snacks or relaxation. Food in restaurant very good. Staff very helpful and efficient. Great location, room, value and staff. Owner is very caring and makes guests comfortable. Highly recommended! Surprisingly clean and comfortable! Definitely a very pleasant experience for me, considering that the fort can be reached through walking distance from the hotel. Hotel Pleasant Haveli - Only Adults This rating is a reflection of how the property compares to the industry standard when it comes to price, facilities and services available. It's based on a self-evaluation by the property. Use this rating to help choose your stay! 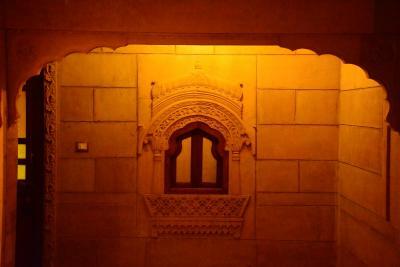 One of our top picks in Jaisalmer.Located at a distance of 1,650 feet from Jaisalmer Fort and 350 feet from Sunset Point, Hotel Pleasant Haveli - Adults Only operates a 24-hour front desk. Free WiFi access is available throughout the property. 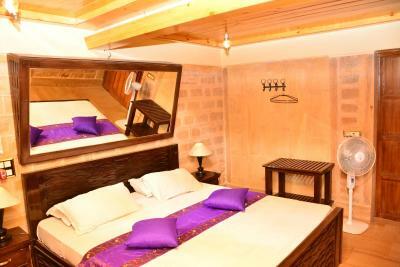 Decorated in traditional décor, each air-conditioned room here will provide you with a cable TV and a seating area. Featuring a shower, private bathroom also comes with free toiletries. At Hotel Pleasant Haveli- Adults Only you will find a terrace and services like laundry and dry cleaning. Other facilities offered at the property include a tour desk. A car can be rented for sightseeing. The property offers free parking. 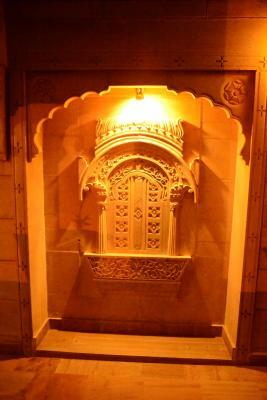 The architectural marvel of Patwa Haveli is within 1,000 feet from the property. The Jaisalmer Railway Station and the Jaisalmer Bus Station are 1.9 mi away. The Jodhpur Airport is 186 mi. 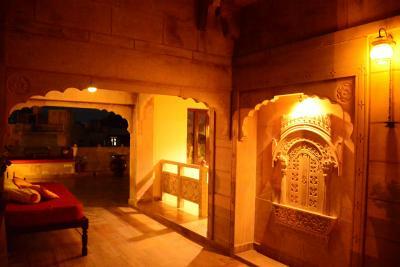 The property houses a rooftop restaurant, Pleasant Haveli that serves Indian, Chinese and continental cuisines. 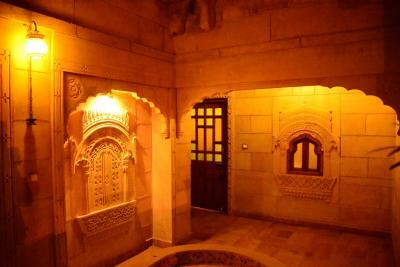 When would you like to stay at Hotel Pleasant Haveli - Only Adults? 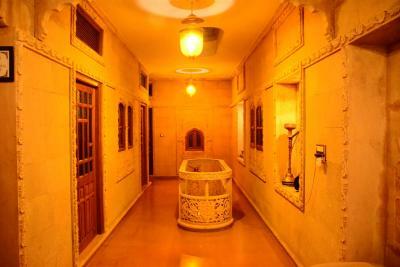 House Rules Hotel Pleasant Haveli - Only Adults takes special requests – add in the next step! Hotel Pleasant Haveli - Only Adults accepts these cards and reserves the right to temporarily hold an amount prior to arrival. A gem of a hotel! We could not have experienced a better stay. Would not hesitate to either recommend or stay again if we get the opportunity to visit beautiful Jaisalmer in the future. Well deserved to be in top few hotels for the town. The only thing that wasn't great was the shower. There was not enough warm water for a truly warm (nevermind hot) shower. They have a solar water heater system on the roof, which is a great idea, but maybe it doesn't get hot enough at some times of the year (we were there in March) or maybe doesn't hold enough water to serve the whole hotel. I'd stay there again even with this issue. The place was great otherwise. One thing to be aware of is that some of the guests can be very loud and chatty in the public space, which could be heard, but it’s really not the hotel’s fault. I had a two nights stay, it was very nice. The staff was very, very curteous and helpful, they even allowed a late checkout. I really liked the location, less than ten minutes to the Fort, I think it’s better than staying inside the fort, more convenient in the evening. I also chose the half day camel safari they offer and there’s nothing to complain about, had a good experience of the desert. My companions in the desert , whose names I Do remember- Sambu and Hucam- showed guest awareness. The food prepared at the restaurant on the top is tasty and reasonably priced!try it! Bathroom was bad. Really needs and upgrade. The trash cans were dirty and the towels were brown with age. Great service and location. Bedroom was nice. 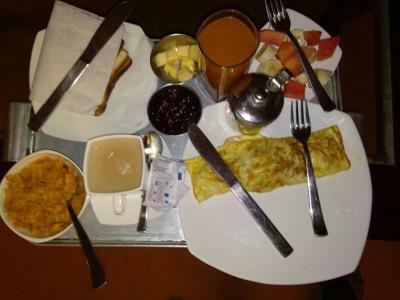 The pleasant hotel is charming, very clean, quiet, well situated not too far by walk to the street market or the fort. The room that we got was huge enough for two and charming. Breakfast and dinner were good. And the staff was always helpful and Very kind. They are offering a desert safari that is great : not too touristic. You can spend the afternoon in the desert, riding camels during one hour then have dinner before heading back to the hotel. No view from rooms, people sometimes not very committed, did not car about my request for a place for massage. Safari made for tourist without any effort to make it a nice experience. Expensive tuk tuk to the airport that took a stone road where the proper road was just parallel. Twice they did not clean the room without even asking if it was needed or not. the food was good, nice people, quite rooms. My partner and I were very satisfied with our stay. The service was excellent, staffs were very helpful and friendly. The bedroom was clean and well maintained. Good location as well and we enjoyed the rooftop view. We highly recommend this hotel. Everything was perfect. Book this one now! Not fault of Hotel but something to be aware of: The wifi around town is not great so you should explore rather than work here. The breakfast selection could have been better. The staff is exceptionally friendly and helped me out with all kinds of small things: arranging airport transfers, storing my luggage while I went on tours, lending me their personal sunglasses because of sandstorms. Another plus is the location: Although not inside the main fort, it has the peace of the town outside the major tourist attraction while a short 5-10 minute walk through the main market leads you to the fort. The roof restaurant has a great view of the city too! I had two nights in the standard and one in the deluxe double room and would argue that the standard is absolutely sufficient for all needs. The Deluxe has a desk which is nice but since internet connection in Jaisalmer is patchy anyways the desk doesn't help much. I would definitely recommend this hotel! Rooms are a bit small. Great location and fantastic rooftop view! Perfection. We arrived by train at 6am. Our prearranged lift was waiting for us and whisked us back to the hotel where our bedroom was so welcome after a 12 hour train journey. Fabulous room with huge bed, very classy bathroom and everything you could expect in a smart hotel ( fridge, kettle, TV). We loved the roof top restaurant where we could sit and watch life go by in the streets below. And all the staff were very impressive. Having stayed in several hotels before arriving here we were impressed with the service which extended to the organisation of a fabulous camel safari.